We’re at the end of bpmNEXT for another year, and we have one last demo. 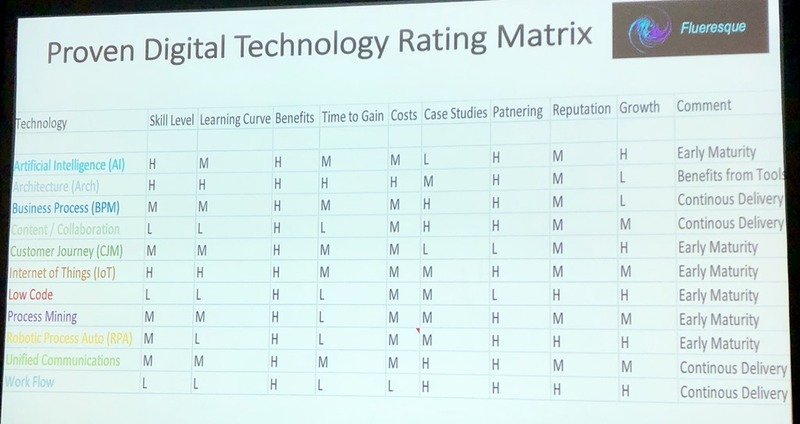 Seshadri showed a demo of their intelligent BPM for an employee onboarding process (integrated with SuccessFactors), where the process can vary widely depending on level, location and other characteristics. This exposes the pre-defined business processes in SuccessFactors, with configuration tools for customizing the process by adding and modifying building blocks to create a process variant for a special case. Decisions involved in the processes can also be configured, as well as dashboards for viewing the processes in flight. Extension workflows can be created by selecting a standard process “recipe” from a SuccessFactors library, then configuring it for the specific use; he showed an example here for adding an equipment provisioning extension that can be added as a service task to one of the top-level process models. He demonstrated a voice-controlled chatbot interface for interacting with processes, allowing a manager to ask what’s happening for them today, and get back information on the new employee onboardings in progress, and expected delays and a link to his task inbox. Tasks can be displayed in the chat interface, and approvals accepted via voice or typed chat. The chatbot is using AI for determining the intent of the input and providing a precise and accurate response, and using ML to provide predictions on the time required to complete processes that are in flight if asked about completion times and possible delays. The chatbot can also make decision table-based recommendations such as creating an IT ticket to assign roles to the new employee and find a desk location. He showed the interface for designing and training the bot capabilities, where a designer can create a new conversational AI skill based on conditions, triggers and actions to take. 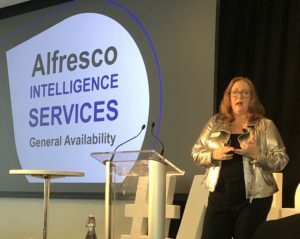 This is currently a lab preview, but will be rolled out as part of their cloud platform workflow (not unique to the SuccessFactors environment) in the coming months. We finished off bpmNEXT 2019 with an update on the DMN TCK, that is, the set of tools provided for free for vendors to test their implementation of DMN. The TCK provides DMN 1.2 models plus sets of input data and expected results; a runner app calls the vendor engine, compares the results and exports them as a CSV file to show compliance. In the three years since this was kicked off, there are eight vendors showing results and over 1000 test cases, with another vendor about to join the list and add another 600 test cases. The test cases are determined through manual examination of the standard specification, so represents a significant amount of work to create this robust set of compliance tests. The TCK group is not creating the standard, but testing it; however, Keith identified some opportunities for the TCK to be more proactive in defining some things such as error handling behavior that the revision task force (RTF) at OMG are unlikely to address in the near term. He also pointed out that there are many more vendors claiming DMN compatibility than have demonstrated that compatibility with the TCK. That’s it for bpmNEXT 2019 – always feels like it’s over too soon, yet I leave with my brain stuffed full of so many good ideas. We’ve done the wrapup survey and heading off to lunch, but the results on Best in Show won’t come out until I’m already on my way to the airport. Lloyd showed a scenario of using decision management to determine if a step could be done by RPA or a human operator, then modeling the RPA “operator” as a role (performer) for a specific task and dynamically assigning work – this is instead of refactoring the BPMS process to include specific RPA robot service tasks. This is shown from an actual case study that uses Sapiens for decision management and Appian for case/process management, with Kapow for RPA. The focus here is on the work assignment decisioning, since the real-world scenario is managing work for thousands of heads-down users, and the redirection of work to RPA can have huge overall cost savings and efficiency improvement even for small tasks such as logging in to the multiple systems required for a user to do work. The RPA flow was created, in part, via the procedural documentation wiki that is provided to train and guide users, and if the robot can’t work a task through to completion then it is passed off to a human operator. The “demo” was actually a pre-recorded screen video, so more like a presentation with a few dynamic bits, but gave an insight into how DM and RPA can be added to an existing complex process in a BPMS to improve efficiency and intelligence. Using this method, work can gradually be carved off and performed by robots (either completely or partially) without significantly refactoring the BPMS process for specific robot tasks. Keith’s demo is based on the premise that although business processes can appear to be simple on the surface when you look at that original clean model, the reality is considerably messier. Instead of predefining a process and forcing workers to follow that in order, he shows defining service descriptions as tasks with their required participants and predecessor tasks. From that, processes can be synthesized at any point during execution that meet the requirements of the remaining tasks; this means that any given process instance may have the tasks in a different order and still be compliant. He showed a use case of a travel authorization process from within Fujitsu, where a travel request automatically generates an initial process – all processes are a straight-through series of steps – but any changes to the parameters of the request may modify the model. This is all based on satisfying the conditions defined by the dependency graph (e.g., departmental manager requires that the manager approve before they can approve it), starting with the end point and chaining backwards through the graph to create the series of steps that have to be performed. Different divisions had different rules around their processes, specifically the Mexico group did not have departmental levels so did not have one of the levels of approval. Adding a step to a process is a matter of adding it as a prerequisite for another task; the new step will then be added to the process and the underlying dependency graph. As an instance executes, the completed tasks become fixed as history but the future tasks can change if there are changes to the tasks dependencies or participants. This methodology allows multiple stakeholders to define and change service descriptions without having a single process owner controlling the end-to-end process orchestration, and have new and in-flight processes generate the optimal path forward. Kris demonstrated working towards an automated process using machine learning (random forest model) in incremental small steps: first, augmenting data, then recommending the next step, and finally learning from what happened in order to potentially automate a task. The scenario was provisioning a new laptop inside an organization through their IT department, including approval, ordering and deployment to the employee. He started with the initial manual process for the first part of this – order by employee, quote provided by vendor, and approval by manager – and looked at how ML could monitor this process over many execution instances, then start providing recommendations to the manager on whether to approve a purchase or not based on parameters such as the requester and the laptop brand. Very consistent history will result in high confidence levels of the recommendation, although more realistic history may have lower confidence levels; the manager can be presented with the confidence level and the parameters on which that was based along with the recommendation itself. In case management scenarios with dynamic task creation, the ML can also make recommendations about creating tasks at a certain stage, such as creating a new task to notify the legal department when the employee is in a certain country. Eventually, this can make recommendations about how to change the initial process/case model to encode that knowledge as new rules and activities, such as adding ad hoc tasks for the tasks that were being added manually, triggered based on new rules detected in the historical instances. 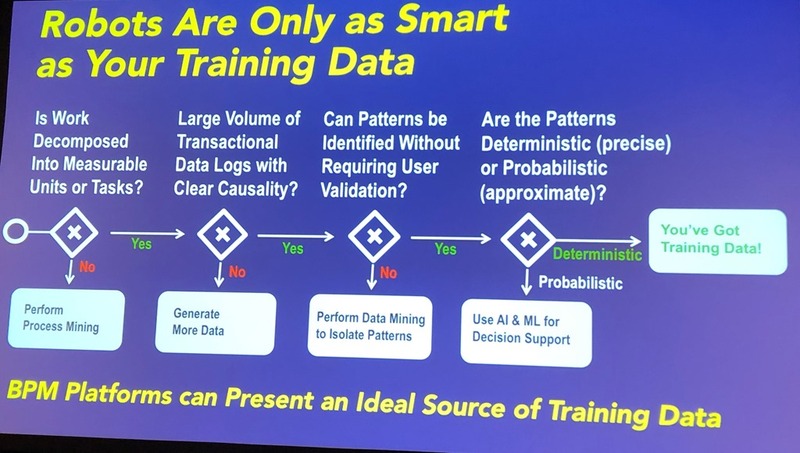 Kris finished with the caveat that machine learning algorithms can be biased by the training data and may not learn the correct behavior; this is why they look at using ML to assist users before incorporating this learned behavior into the pre-defined process or case models.